How to describe Spore? It's a fun, easy-to-use 'God-sim' videogame that pushes the boundaries of its genre. 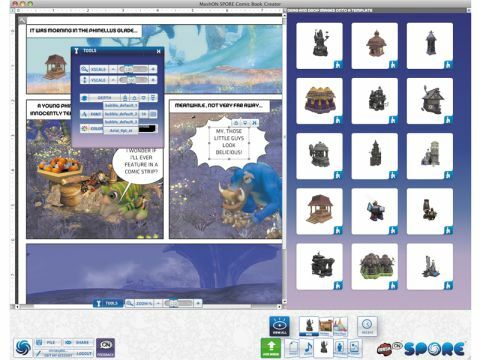 What about Spore Comic Book Creator? It's a tortuous, counterintuitive mess that is utterly pedestrian in its approach and output! Comic Book Creator is developed by a different company to the one that created Spore, and boy, does it show. The idea is laudable, if a bit niche: if you love the videogame, enough, you can buy this app and create comic strips using your creatures. The problems are many. It's an app developed in Adobe's AIR environment. AIR has many benefits – it's cross-platform, easy to code for, and reliant on technologies such as Flash that many developers are fluent in. Installation was sluggish, mouse-clicks sometimes took seconds, and the spinning beachball was ever-present. Worse, the interface didn't use standard commands – selecting an object and tapping delete did nothing, you couldn't select multiple objects, and there were no shortcuts or even the ability to undo. However, there's loads of graphics to use, including backgrounds that you can drop into the grids, and lots of creatures and objects. But they're just flat graphics, not 3D objects. You can't even flip graphics to make them face a different way. You can save your own creatures from Spore, but they're low-res PNGs that don't scale well.